Last night, April 16, 2016, we attended the University of Wisconsin Varsity Band Concert titled "We've Done It Our Way". It was everything we expected and more. I had seen the band in other smaller venues without the entire band of over 300 students and without all the fanfare. For those who aren't familiar with this university band, it is amazing. It is due to all the outstanding efforts by the students but the main reason for their success is the band director Mike Leckrone. He has been the band director since 1969 and has continued to make being in the band an honored experience and something for every student involved to be proud of. How these students can participate in over 150 performances throughout this school year and still attend class and succeed in school requires a lot of dedication and hard work. It surprised me that 35% of the band members are engineering students and only 4% were music majors. Mike Leckrone is not only a terrific band director and arranger, he is a true showman and performer. This year he made his entrance with Bucky Badger in a boat sailing down from the ceiling on a wire and landing on the stage. The show was almost three hours long and included songs from the Eagles in honor of Glen Frye, Frank Sinatra who Did It His Way, a Richie Valens hit La Bamba, famous TV themes, songs from Les Miserables plus all the favorites Wisconsin fans know and love. Another big entrance was made by Mike after intermission. He flew in on a rocket made of cheese. Wisconsin and cheese go together. Then if that wasn't enough, this man who is 79 years old, came flying above the crowd on a wire. He did somersaults and flips as the band played. It was an amazing sight to see. 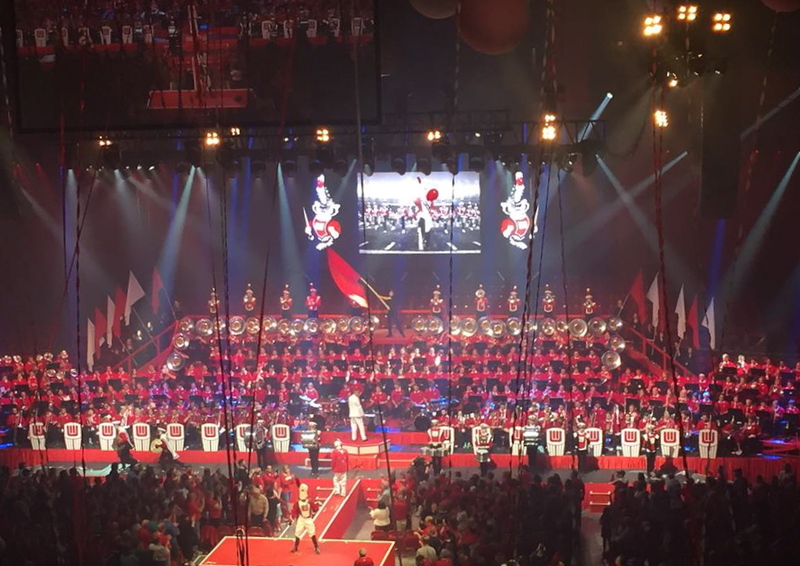 I imagine all universities have bands who play at sporting events and major celebrations but I think the University of Wisconsin Varsity Band is unique. Thousands and thousands of people attend performances throughout the state every year. It shows that practice makes perfect and they are as close to perfect as they can get. It will be a sad day when Mike is no longer able to direct the band. I think he will be a hard act to follow, but his legacy will continue into the next generation.